In ancient times, many students would unconditionally sacrifice their lives to their training and beg masters to take them, often striving to prove themselves worthy for many weeks, months or years before they were accepted. In ancient times, many students would unconditionally sacrifice their lives to their training and beg masters to take them, often striving to prove themselves worthy for many weeks, months or years before they were accepted. Given today's lifestyles, careers, and obligations, those qualities in a student have become much more of a rarity and gem. Nowadays, we find that the situation is oftentimes quite the opposite. Masters, instructors, and school directors are almost begging students to stay, to either pass down their knowledge or to help bring in additional income. It has become increasingly difficult for masters to find students willing, worthy, and capable of learning the vast amount of knowledge that they have to offer, and it is even more difficult when expenses pile up and bills can not be paid. Money is oftentimes a determining factor in the success of modern day schools, and honestly, it should not be. In ancient China, many students trained for free as long as they offered the dedication, hard work, and loyalty that masters were looking for. Living in modernized and urbanized societies today, though, teachers are unable to support themselves by accepting students in this way. With this type of desperation, masters of today unfortunately are occasionally treated by students with inexcusable disrespect. In the age of the cell phone, where accomplishing several everyday tasks has been simplified to the push of a few buttons, many people will either simply marvel or laugh when they are told that achieving a profound level of martial arts takes decades of training and a lifetime to perfect. Some will attempt it, but few succeed. Once in a blue moon, perhaps a student or two will reach this distant goal. It is similar to how Beethoven and Mozart are just two of a handful of the most famous composers that achieved such a great and deep level of skill, such that hundreds of years later, people are still talking about their work and original creations. Art, no matter what form it takes, is a complex and ever-evolving entity. Few truly grasp the deep meaning behind it, but many know to appreciate and enjoy it. We have recently passed a generation of martial arts greats, and the new generation still has yet to take form. In today's technological world, people tend to expect a “push-button” type of solution. Martial arts, however, has never been an art where a student can truly become a master, or even a black belt, in a short amount of time or any given set amount of time. We must remember that what we see is not an accurate representation of what is truly felt and understood. In fact, any skill of art may be shallow if it is missing the underlying emotions and feeling of the history that has led up to what it is today. How many “qualified” martial arts masters are truly able to fight or comprehend the depth of the training philosophy? It amazes me how loosely the term “master” is thrown around these days. How can we even begin to compare ourselves to or comprehend the knowledge of the masters of ancient times? Simple answer is: we can't, at least not yet. And that is why we often exaggerate and fantasize about martial arts in the media, which is particularly apparent in movies and on TV. It is a pity that the media, which carries such a great influence on the general public, is so focused on only the results, potential, or fictional aspects of training, and downplays the process and methodology. It tends towards portraying martial arts as a form of entertainment or sports. Students training for the discipline of their mind or way of life, as in older times, are much more uncommon. It is important to recognize the fact that these days, the amount of time a student trains is no longer an accurate measure of proficiency, comprehension, or even qualification in the art, in whatever style is being trained. Without the correct mind and discipline to train, a student can train for 10, 20, or 50 years and still have a very shallow understanding and skill level. That is the importance of having a master, instructors, and training partners to help guide you throughout the process. However, even the skill level of your teachers may in fact, be limited, and the depth and advancement of your training will ultimately boil down to yourself, your mind, focus, understanding, and resourcefulness. Throughout history, many martial arts styles were created or derived from other styles after a thorough understanding of the basic theory, principles, and foundation was established. It is usually the hope of teachers that students will take what they learn and morph it into their own, to become one of the greats, like for example, Beethoven did in his work. In today's society, though, many students skip steps and create styles or jump to the title of “master” before they truly reach a qualified level. Such styles were created or derived from weak, shallow, and misunderstood concepts of martial arts and differ greatly from those that evolved out of hundreds of years of history and training. While it may serve as some publicity and promotion, many martial arts “masters” today continue to ignorantly create and develop from their imagination and misconceived media instead of from dedicated practice and experience. Disappointingly, such schemes are usually based upon making money, ego, dignity, fame, and glory. It is damaging to the true meaning of the art. I encourage everybody to seek out and train the real root of the art through authentic traditional styles and to train for yourself with no dignity, according to the principles of martial morality. Do not train to show off, seek fame, or achieve power over others, as all of these actions betray the true meaning of the practice. Real success and understanding of the training depends heavily on your self-discipline, morality, and how diligently you train, not on cheating yourself, deceiving others, or creating false notions of progress. There is a great culture and history behind martial arts, beyond what the media portrays, and we should always keep the great martial arts teachers and peers that inspire us in our minds. Reflect on how they inspire us, what they teach us, what qualities make them unique and outstanding, and how they have an impact on our lives. Ask yourself whether you are one day going to be one of the next martial arts pioneers of the world, who inspires and creates passion in an entire generation, or whether you are only going to be a casual practitioner. We have the ability and potential to achieve a lot for our generation and community, but we need a stronger push in the right direction. As a community, martial artists should work together and become role models in modernizing martial arts to push towards a highly-refined, new art, fit for our time and century. Instead of romanticizing about the amazing feats that martial artists were capable of in the past, we can pioneer the new generation into recreating them. There is no reason why martial arts cannot be as mainstream as pro-sports, music, and literature. Martial arts encompasses the same depth of skill, history, and knowledge, if not more. There is no need to stringently copy the ways of ancient times, as our world has modernized, but I believe it is important to preserve the quintessential characteristics of true and traditional martial arts training before we lose the opportunity to do so. One of my sincerest hopes is to educate the world about the subtle yet powerful influences that martial arts training can have on our lives. It is more than just a bunch of kicks, punches, and acrobatics; it is a way of learning about life. The method towards accomplishing this goal for us, as martial artists, is to excel in what we do and to preserve the original essence of the art that was developed hundreds of years ago. End of Part 2. Read Part 3 here. A new seminar season will begin on January 17th, 2009. 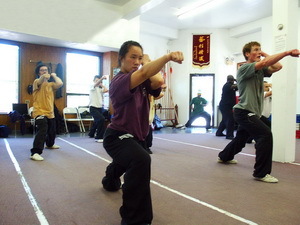 Many topics about Chinese Martial Arts will be taught by Nicholas Yang and Dr. Yang, Jwing-Ming. Find out more about how you can learn with these two renowned teachers.